Here is the list of the hotels near Louroux-de-Bouble. Book your hotel near Louroux-de-Bouble today, Friday 10 May for the best price, reservation and cancellation free of charge thanks to our partner Booking.com, leader in on-line hotels reservation. Below here is the list the 50 closest hotels of Louroux-de-Bouble, sortable according your criteria. You will find the position of these accommodations on the Louroux-de-Bouble hotels map. Situated in Vernusse, Le Moulin Berthon offers accommodation with access to a garden. Free WiFi is offered. Some units also have a kitchen equipped with a dishwasher, an oven, and a microwave. Breakfast is available daily, and includes continental and buffet options. The property has a sauna, a fitness centre and an indoor pool. The property has a playground. The nearest airport is Clermont-Ferrand Auvergne Airport, 67 km from the property. Hotel La Croix des Bois is a 2-star property set in Lalizolle. This 2-star hotel offers a shared lounge and free WiFi. Guests can have a drink at the bar. At the hotel, all rooms include a wardrobe and a flat-screen TV. Rooms come with a private bathroom with a shower. Guests at Hotel La Croix des Bois can enjoy a continental breakfast. The restaurant at the accommodation specialises in French cuisine. Hotel La Croix des Bois offers a barbecue. Vichy is 46 km from the hotel. The nearest airport is Clermont-Ferrand Auvergne Airport, 60 km from the property. Gîte Brénazet is set in the Auvergne region on a remodelled farm dating from 1850 and offers a self-catering cottage. The property has a large garden and features a natural swimming pool. Free Wi-Fi access is provided. The cottage has 2 private terraces and includes an equipped open-plan kitchen, a dining area and a seating area. There are 2 bedrooms and the bathroom is fitted with a shower. On site, the owners organise a variety of activities during high season, such as yoga classes, building with natural materials, pony trekking and canoeing excursions. The property is a 45-minute drive from Montluçon. Offering free WiFi and garden views, Croix de Chassat is an accommodation set in Bellenaves. Guests staying at this country house have access to a fully equipped kitchen and a terrace. The country house is equipped with a flat-screen TV. The country house offers a barbecue. Guests can relax in the garden at the property. Vichy is 45 km from Croix de Chassat. The nearest airport is Clermont-Ferrand Auvergne Airport, 59 km from the accommodation. Guest accommodation Durmignat Preferred hotel ! Situated in Durmignat, La Belle Vue offers accommodation with a private pool and mountain views. With pool views, this accommodation features a terrace. The 2-bedroom holiday home is fitted with a kitchen with an oven and 1 bathroom with a shower. A flat-screen TV with satellite channels and a DVD player are available. The holiday home offers an outdoor pool. Guests at this property can enjoy fishing and hiking nearby, or make the most of the garden. Montluçon is 34 km from La Belle Vue. The nearest airport is Clermont-Ferrand Auvergne Airport, 68 km from the accommodation. Featuring a swimming pool, a garden and a terrace and views of the mountain, Maison Balady is set in Bellenaves and features accommodation with free WiFi. All units come with a seating area, a flat-screen TV and a private bathroom with a hair dryer and shower. There is also a kitchen in some of the units equipped with an oven, a toaster, and a fridge. A continental breakfast is available each morning at the property. If you would like to discover the area, cycling is possible in the surroundings and the property can arrange a bicycle rental service. Vichy is 46 km from the bed and breakfast, while Riom is 48 km from the property. The nearest airport is Clermont-Ferrand Auvergne Airport, 60 km from Maison Balady. Guest accommodation Target Preferred hotel ! Domaine des Grandes Côtes welcomes you to 45 hectares of meadows and forest, with caravans and yurts overlooking the gorges of Bouble. It features a covered heated swimming pool, a hot tub, a sauna, a games room, and a Disc Golf course. Caravans (among which one is accessible to wheelchairs) and the contemporary yurts that include toilets and showers are set around a main hall in which you will find a bar, a film theatre, a children's playground, a barbecue, a sports room. Free private parking is available on site and free Wi-Fi access is provided in the public areas of the property. Gite De Lalizolle is situated in Lalizolle and offers barbecue facilities. Including a terrace, this holiday home also has a restaurant. The holiday home is equipped with 6 bedrooms, a TV and a fully equipped kitchen that provides guests with a dishwasher. The holiday home offers a children's playground. Hiking can be enjoyed nearby. Vichy is 42 km from Gite De Lalizolle, while Montluçon is 46 km away. The nearest airport is Clermont-Ferrand Auvergne Airport, 56 km from the property. Situated in Lalizolle, Camping Des Papillons offers accommodation with free WiFi and access to a garden and an outdoor pool. All units include a fully equipped kitchenette, allowing guests to prepare their own meals. Some units have a dining area and/or a terrace. A continental breakfast is served daily at the property. The camping offers a barbecue. If you would like to discover the area, cycling is possible in the surroundings. Vichy is 42 km from Camping Des Papillons, while Montluçon is 46 km away. The nearest airport is Clermont-Ferrand Auvergne Airport, 56 km from the accommodation. Offering free WiFi and lake views, Holiday home Augeres 1 is an accommodation situated in Lapeyrouse. 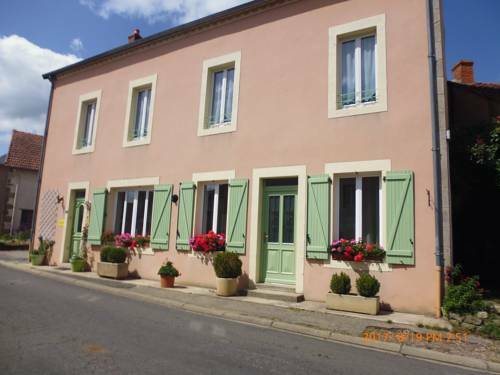 The holiday home has garden views and is 28 km from Montluçon. The holiday home features 2 bedrooms and a fully fitted kitchen with a dishwasher and an oven. A TV with satellite channels is provided. The holiday home offers a barbecue. The nearest airport is Clermont-Ferrand Auvergne Airport, 71 km from Holiday home Augeres 1. Holiday home Augeres 2 is located in Lapeyrouse. This holiday home also has free WiFi. This 2-bedroom holiday home comes with a seating area, a TV, a DVD player and a kitchen with a dishwasher. The holiday home offers a barbecue. Montluçon is 28 km from Holiday home Augeres 2. The nearest airport is Clermont-Ferrand Auvergne Airport, 71 km from the accommodation. Homestay Chante Cristal is set in Target, 33 km from Vichy. Free private parking is available on site. You will find a coffee machine in the room. The room is equipped with a private bathroom. For your comfort, you will find bathrobes and a hairdryer. You can play tennis nearby, and the area is popular for hiking. Moulins is 37 km from Homestay Chante Cristal, while Montluçon is 35 km from the property. Clermont-Ferrand Auvergne Airport is 56 km away. Located in Target in the Auvergne Region, this semi-detached holiday home features a terrace and a garden with a barbecue and a terrace. The air-conditioned unit is 33 km from Vichy, and guests benefit from free WiFi and private parking available on site. The kitchen features an oven, a microwave and a toaster and there is a private bathroom. A flat-screen TV and DVD player, as well as a CD player are offered. An on-site group yoga class is included in the price for all guests and further classes can be provided for an extra charge. Moulins is 37 km from Chante-Cristal, while Montluçon is 35 km from the property. Clermont-Ferrand Auvergne Airport is 56 km away. Bed and Breakfast Beaune dʼAllier Preferred hotel ! Featuring free WIFI and a seasonal heated outdoor pool, Shenmen offers accommodation in Beaune D'Allier. Free private parking is available on site. Each unit has a private bathroom equipped with a walk-in shower and a hairdryer. At Shenmen, guests can enjoy a boules pitch on site, a large terrace and a garden. Guests can enjoy various activities in the surroundings, including cycling, walking and horse riding. Vichy is 57 km from Shenmen, while Moulins is 53 km away. Clermont Ferrand Auvergne Airport is 81 km from the property. Situated in Beaune dʼAllier, Gîte Shenmen features a private pool and free WiFi. Guests can go for a swim in the outdoor pool. Providing access to a terrace, this apartment comes with 2 separate bedrooms. The kitchen has a dishwasher, an oven and a microwave, as well as coffee machine and kettle. Guests can relax in the garden at the property. Montluçon is 29 km from the apartment. Clermont-Ferrand Auvergne Airport is 81 km away. Offering a restaurant, Le Bocage is located in the city centre of Montmarault. Free WiFi access is available. Each room here features a desk, a wardrobe and cable TV. The private bathroom has a bath or shower and a hairdryer. At Le Bocage you will find a garden, a terrace and a bar. Other facilities offered at the property include luggage storage and newspapers. Clermont-Ferrand Auvergne Airport is 73 km away. The access to A71 highway is 1.6 km from the hotel. The property offers free parking. Located in Vicq, Sur Le Chemin Des Buvats is just 6 km from the medieval village of Charroux and offers a garden with furnished terrace. You can enjoy the outdoor swimming pool, the sauna and the hot tub. All of the rooms at Sur Le Chemin Des Buvats have exposed wooden beams, a wooden floor and a wardrobe. Each room also includes a private bathroom with a shower and free toiletries. A continental breakfast is served every morning in the shared lounge. Upon prior reservation, picnic baskets are available and the hosts can also prepare traditional dinners with home-grown vegetables. Free Wi-Fi is available throughout the property. Free private parking is possible on site and Vichy is 30 km from the B&B. Hôtel de France is offering accommodation in Montmarault. This 3-star hotel offers a garden. Both free WiFi and private parking are available at this property. A continental breakfast can be enjoyed at the property. Moulins is 45 km from the hotel. Clermont-Ferrand Auvergne Airport is 75 km away. Hotel Montmarault Preferred hotel ! Featuring a sun terrace, Hostellerie du Centrotel et Spa is located in Montmarault. Exit 11 of Motorway A71 is just 800 metres from the hotel and Montluçon is 35 km away. The rooms feature air conditioning, a flat-screen TV with satellite channels, a desk and a wardrobe. The private bathroom has a shower, free toiletries and a hairdryer. A buffet breakfast with local produce is served every morning. The hotel’s restaurant offers traditional, French cuisine for dinner and boasts exposed wooden beams. An extensive wine list is available. Guests have access to a wellness centre with a sauna and hammam for an additional charge. Meeting facilities and free WiFi are available at Centrotel. Free private parking is provided and covered parking is also possible with an extra cost. Situated in Montmarault, Fasthotel Montmarault offers a garden. Featuring a shared lounge, this property also provides guests with a restaurant. The property offers mountain views, a terrace, and free WiFi is available. At the hotel, rooms include a desk. Rooms come with a flat-screen TV, and certain units at Fasthotel Montmarault have a garden view. At the accommodation rooms are equipped with air conditioning and a private bathroom. Breakfast is available each morning, and includes continental and buffet options. Cycling is among the activities that guests can enjoy near Fasthotel Montmarault. Moulins is 44 km from the hotel. Clermont-Ferrand Auvergne Airport is 74 km from the property. A hotel set near La Sioule River, Hotel Restaurant Les Gorges de Chouvigny offers an à la carte restaurant, and en-suite rooms. The rooms at Hotel Restaurant Les Gorges de Chouvigny feature a wardrobe and the private bathrooms are complete with a shower. With a terrace and view of the river, the restaurant serves traditional French cuisine and regional specialities prepared with fresh seasonal products. It is available with prior reservation. Hotel Restaurant Les Gorges de Chouvigny is 32 km from Montluçon, and free private parking is provided on site. Offering a seasonal outdoor pool and a garden, Sans Parure is located in Buxières-sous-Montaigut. Free WiFi access is available in these holiday homes. The air-conditioned holiday homes feature a terrace. There is a fully equipped kitchen with a microwave and an oven. Private bathrooms have a shower. You can enjoy a mountain and garden view from the room. An array of activities can be enjoyed on site or in the surroundings, including horse riding, fishing and canoeing. This holiday home is 52 km from Clermont-Ferrand Auvergne Airport. Featuring free WiFi, Le Beau Site Auvergne is located in Servant. Guests can enjoy river views. The rooms include a private bathroom with free toiletries. A continental breakfast can be enjoyed at the property. Vichy is 45 km from the hotel. The nearest airport is Clermont-Ferrand Auvergne Airport, 56 km from Le Beau Site Auvergne. Bed and Breakfast Voussac Preferred hotel ! Offering a sun terrace and views of the garden, Le champ Bagnolet is situated in Voussac. Free WiFi is available and free private parking is available on site. All rooms have a flat-screen TV and you will find a shared lounge at the property. Evening meals are available upon prior reservation. You can play billiards at this bed and breakfast, and the area is popular for cycling and fishing. The bed and breakfast also offers free use of bicycles. Vichy is 35 km from Le champ Bagnolet, while Moulins is 34 km away. The nearest airport is Clermont-Ferrand Auvergne Airport, 60 km from Le champ Bagnolet. Le Moulin de Saint Gal is situated in Saint-Gal-sur-Sioule. The property was built in 19th century, and has accommodation with free WiFi. The bed and breakfast is equipped with a satellite flat-screen TV. A continental breakfast can be enjoyed at the property. The bed and breakfast offers a terrace. Guests at this property can enjoy cycling nearby, or make the most of the garden. Vichy is 40 km from Le Moulin de Saint Gal, while Montluçon is 49 km away. The nearest airport is Clermont-Ferrand Auvergne Airport, 54 km from the property. Situated in Saint-Gal-sur-Sioule, Camping Du Pont De St Gal offers accommodation with a terrace. Free WiFi is provided. The units have a fully equipped kitchen with a microwave, coffee machine, and a fridge. There is a seating and a dining area in all units. A continental breakfast is available daily at the camping. Cycling can be enjoyed nearby. Vichy is 40 km from CAMPING DU PONT DE ST GAL, while Montluçon is 49 km away. The nearest airport is Clermont-Ferrand Auvergne Airport, 54 km from the accommodation. Set in Saint-Éloy-les-Mines, this hotel offers a garden, 2 lounges and conference facilities. Free private parking is available on site and Lapeyrouse Train Station is 10 km away. The rooms at Hôtel Le Saint Joseph are contemporary in style and feature an LCD TV. All rooms have free WiFi access and some are suitable for guests with reduced mobility. A buffet breakfast is served every morning at the hotel, in the dining room. You can also enjoy a drink in the bar. In the local area you can enjoy hiking, mountain biking, canoeing and skydiving. The Mine Museum is 50 metres away, while Vulcania Theme Park is a 45-minute drive from the property. Montluçon Train Station is 29 km from Hôtel - Restaurant Le Saint Joseph. The nearest airport is Clermont-Ferrand Auvergne Airport, 63 km from the property. Set in Chouvigny in the Auvergne region, Bernadette features accommodation with free WiFi. A continental breakfast is available daily at the homestay. Vichy is 38 km from Bernadette. The nearest airport is Clermont-Ferrand Auvergne Airport, 52 km from the accommodation. Boasting a garden, Gîte 'La FAYE features accommodation in Menat with free WiFi and mountain views. The apartment is fitted with 1 bedroom, a kitchen with a microwave and a bathroom with a shower. Clermont-Ferrand is 40 km from Gîte 'La FAYE. Clermont-Ferrand Auvergne Airport is 42 km from the property. Vacances Les Courrais, located in La Celle, is a holiday park offering self-catering gypsy-style caravans and an outdoor pool. These unconventional lodgings include a kitchen, dining area and WC. Guests also have access to a bathroom with shower. Additional facilities include free Wi-Fi. If you wish to dine out, you can find restaurants 3 km from the property. Grocery shops can be found 6 km away. The property is situated in the Auvergne region, famed for its volcanoes and diverse topography and vegetation. The landscape thus lends itself to outdoor activities such as hiking and mountain biking. Featuring accommodation with a terrace, fabyphil is situated in Saint-Éloy-les-Mines. Guests staying at this holiday home have access to a fully equipped kitchen and a patio. The holiday home comes with a satellite flat-screen TV and 3 bedrooms. When guests need guidance on where to visit, the reception will be happy to provide advice. Hiking can be enjoyed nearby. Montluçon is 35 km from the holiday home, while Riom is 43 km from the property. The nearest airport is Clermont-Ferrand Auvergne Airport, 61 km from fabyphil. Bed and Breakfast Vicq Preferred hotel ! Located in Vicq in the Auvergne Region, 39 km from Clermont-Ferrand, Le Moulin des Valignards is a 19th-century property offering barbecue facilities and a sun terrace. Free private parking is available on site. All rooms come with a private bathroom. Guests can enjoy various activities in the surroundings, including horse-riding and canoeing. Restaurants are available within 2 km from the property. The property is just 5 km from the A71 motorway exit between Vichy and Clermont. Vichy is 24 km from Le Moulin des Valignards, while Montluçon is 45 km from the property. The nearest airport is Clermont-Ferrand Auvergne Airport, 38 km from Le Moulin des Valignards. Provided with free Wi-Fi, this original gypsy-style wooden caravan is located in La Celle, 20 km from Montluçon. Guests can enjoy the furnished terrace and a welcome drink is served upon arrival. With a colorful décor, La Roulotte De Lola is an eco-friendly wooden caravan including a seating area and a private bathroom with shower and dry toilets. Homemade jam and local honey are served for breakfast. Guests can also request homemade evening meals of fresh produce for an additional charge. Nearby you will find a pond where you can go fishing. You may also have long walks and bike rides. The thermal city of Néris-les-Bains is a 20-minute drive from La Roulotte De Lola. Featuring a garden and a restaurant, Schenendoa - Maison d'hôtes is located in La Celle. With a terrace, the property also has a shared lounge. Both free WiFi and secured private parking are accessible at the guest house. Each room has a private bathroom with a shower and free toiletries. A continental breakfast is served each morning at the property. Montluçon is 19 km from Schenendoa - Maison d'hôtes, while Riom is 45 km away. The nearest airport is Clermont-Ferrand Auvergne Airport, 57 km from the property. Entre Clermont Ferrand Et Montluçon is set in Neuf-Église and offers water sports facilities. Guests may enjoy the free WiFi. Leading onto a terrace, the holiday home consists of 2 bedrooms and a fully equipped kitchen. A TV is available. The holiday home offers a barbecue. A garden and a children's playground are featured at the property. Montluçon is 37 km from Entre ClerMt Ferand, while Riom is 40 km from the property. The nearest airport is Clermont-Ferrand Auvergne Airport, 57 km from the property. Situated in Menat in the Auvergne Region, this detached holiday home is 37 km from Clermont-Ferrand. The property features views of the garden and is 39 km from Vichy. Free WiFi is provided . The kitchen has a microwave and a toaster. A TV is featured. A baby kit is available onsite. Other facilities at gite de l'orchidee include a barbecue. Montluçon is 37 km from gite de l'orchidée, while Riom is 27 km away. The area is popular for cycling and fishing. The nearest airport is Clermont-Ferrand Auvergne Airport, 39 km from the property. Housed in a 13th-century château, Château du Max is a 5-minute drive from the centre of Le Theil and 13 km from the A71 motorway. It offers free Wi-Fi access in public areas and an antique-style décor. Rooms are individually decorated and feature a TV and a private bathroom with a bath. One of the rooms is located in the main tower. Guests are invited to enjoy a daily breakfast at Château du Max. Evening meals can also be served on request in the dining room, which features a chandelier and antique-style furniture. Activities in the area include fishing, hiking and mountain biking. You can visit the Château de Fontariol, which is just 3 km away. Free private parking is available on site. Bed and Breakfast Bézenet Preferred hotel ! Located in Allier, La Longère des Gillettes offers B&B accommodation with a large garden. Montluçon is just a 20-minute drive away and Moulins is a 45-minute drive from the property. Accessed by a private entrance, all rooms feature a garden view, a TV, desk, wardrobe and tea and coffee making facilities. The en suite bathroom includes a hairdryer and free toiletries. A continental breakfast serving bread, homemade brioche and cake, hot drinks and orange juice is provided each morning. Guests can also sample traditional cuisine in a meal prepared by the host, upon request. Additional features include free Wi-Fi access throughout and free private parking on site. Guests can also find hiking and bike riding activities in the area and a fishing pond is located 2 km away. Auberge du Château in Saint-Rémy-de-Blot provides accommodation with a garden, a terrace and a shared lounge. Each accommodation at the 2-star hotel has garden views and free WiFi. There is a restaurant. At the hotel, rooms have a desk. All rooms come with a private bathroom with free toiletries. At Auberge du Château each room has a wardrobe and a flat-screen TV. A continental breakfast is served daily at the property. The accommodation offers a children's playground. The area is popular for cycling, and bike hire is available at this 2-star hotel. Vichy is 49 km from Auberge du Château, while Montluçon is 47 km from the property. Clermont-Ferrand Auvergne Airport is 49 km away. Holiday home La Grange is located in Le Quartier and offers water sports facilities and barbecue facilities. Guests have access to free WiFi. The holiday home includes 1 bedroom and a kitchen with an oven and a fridge. A TV and a DVD player are offered. Guests at this property can enjoy horse riding nearby, or make the most of the garden. Montluçon is 32 km from the holiday home. Clermont-Ferrand Auvergne Airport is 68 km away. Situated in Ars-les-Favets, Chambres d´Hôtes Clara Casa features accommodation with a seating area and flat-screen TV. Free WiFi is available. Guests at the bed and breakfast can enjoy a continental breakfast. Chambres d´Hôtes Clara Casa offers a children's playground. Guests can relax in the garden at the property. Montluçon is 24 km from the accommodation. The nearest airport is Clermont-Ferrand Auvergne Airport, 71 km from Chambres d´Hôtes Clara Casa. Located in Teilhet, 36 km from Montluçon, Le Peyroux offers a garden and free WiFi. Some units include a seating area and/or a terrace. A continental breakfast can be enjoyed at the property. Hiking can be enjoyed nearby. Riom is 47 km from the bed and breakfast. The nearest airport is Clermont-Ferrand Auvergne Airport, 64 km from the property. Featuring countryside views from each of its guest rooms, La Claie des Champs is situated in the Auvergne region. The hotel also offers 24-hour reception, an on-site restaurant and free Wi-Fi access throughout. The spacious guest rooms have polished timber floors and a flat-screen TV with satellite channels. Each has facilities for ironing and making hot drinks and a private bathroom with a hairdryer. Guests can choose a continental or buffet breakfast every morning. The ground floor restaurant serves traditional dishes from the region. It has a stone feature wall and terrace dining during warmer months. Free private parking is available on site. The 14th-century Château de Pionsat is 11 km from La Claie des Champs and Montluçon is 23 km away. La Ferme de Gouzinat is set in Sainte-Christine. Guests staying at this holiday home have access to a fully equipped kitchen. Montluçon is 44 km from the holiday home, while Riom is 45 km from the property. The nearest airport is Clermont-Ferrand Auvergne Airport, 63 km from the property. Le Fontariol is set in Le Theil. The property, housed in a building dating from 2006, features free WiFi. The holiday home is located on the ground floor and features 3 bedrooms, a TV with satellite channels and a fully equipped kitchen that provides guests with a dishwasher and an oven. Vichy is 36 km from the holiday home. The nearest airport is Clermont-Ferrand Auvergne Airport, 65 km from Le Fontariol. Hotel Commentry Preferred hotel ! Located 4 km from the famous thermal resort of Neris-les-Bains and only 15 minutes from Montlucon city centre, this property features spacious and bright rooms that will welcome you in a friendly and warm atmosphere. The Lyon Vert is a 3-minute-walk away from Commentry city centre and its shops, in a calm area, away from the road and overlooking gardens, which will allow you to spend a relaxing and quiet stay. This hotel also features a terrace and you will enjoy the wide range of sweet and salted choices at the buffet breakfast. Situated in Saint-Germain-de-Salles, 9.5 km from the A719 motorway and set in a tree-filled park on the edge of La Sioule River, Domaine les Gandins is a guest house offering a large terrace with wooden furniture, a library, a children's playground and free WiFi access. Featuring a shower, the private bathrooms also come with a hairdryer and towels. Some of the accommodations are attic bedrooms. The French traditional breakfast is served every morning. Guests can share a 4-course dinner, including wine and coffee, at the owner's table. Karts and a games room are available at Domaine Les Gandins. Walking can be enjoyed along la Sioule River, as well as a heated outdoor pool. Offering free parking, the property is 20 minutes' drive from Gannat, 8 km from Charroux medieval village and 19 km from Vichy's thermal baths. Located in Blot-lʼÉglise, Moulin de la Fayolle offers accommodation with free WiFi and a garden with a terrace and mountain views. The accommodation has a sauna. The bed and breakfast offers a seating area with a flat-screen TV and a private bathroom with free toiletries and shower. There is also a kitchen in some of the units equipped with an oven, a microwave, and a fridge. A continental breakfast is available daily at the property. Cycling is possible within the area and the property offers water sports facilities. Montluçon is 49 km from Moulin de la Fayolle, while Riom is 35 km from the property. The nearest airport is Clermont-Ferrand Auvergne Airport, 56 km from the property. Hotel Gannat Preferred hotel ! Set on a 1700 m² garden, La Coraline is 500 metres from the centre of Gannat and 2 km from the A719 motorway. It offers a terrace and soundproofed guestrooms. Guests are invited to enjoy a daily continental breakfast. With a chandelier, all rooms feature wooden floors, garden views and a flat-screen TV. The private bathroom is complete with a bath or shower. La Coraline is 23 km from Vichy and 14 km from the medieval village of Charroux. The A71 motorway is 8 km away and the A89 motorway is 23 km away. Gannat Train station is 1 km away and Jayet Aerodrome is 5 km from the property. The owners can pick you up at the aerodrome upon request. Below here is the hotels map of Louroux-de-Bouble. Names and details of Louroux-de-Bouble hotels can be shown on the map clicking on the prices icons.